Though Ohio State’s students went home for break, many athletes continued their seasons. This is a roundup of news that happened involving Ohio State teams and athletes. The No. 10 Ohio State women’s basketball team responded from a 69-60 road loss to No. 16 Duke by rattling off an eight-game win streak. It capped off the stretch with a 78-71 road overtime win against No. 23 Michigan Sunday afternoon. Preseason All-American guard Kelsey Mitchell helped spark the run and earned conference player of the weeks honors Monday for the third time this season. She has not scored less than 21 points in her past seven games, which includes a 37-point performance against Michigan and a 31-point, nine-assist, seven-rebound showing against Cincinnati. Senior guards Linnae Harper and Sierra Calhoun also have consistently performed well during the win streak. Calhoun scored in double figures in seven of the past eight games and Harper has not scored less than 10 points the entire season. Ohio State’s schedule gets tougher in the next couple of weeks. The Buckeyes have a rematch against Michigan in Columbus on Jan. 16, then go on the road for matchups with No. 11 Maryland on Jan. 22 and No. 18 Iowa on Jan. 25. After two years of college, Francesca Di Lorenzo determined she was ready for another challenge. The two-time singles All-American, two-time Big Ten Player of the Year and one-time doubles All-American decided to forgo her remaining college years and pursue a professional tennis career. Di Lorenzo is ranked 303rd internationally in singles and 356th in doubles by WTA Tennis. The only 100-goal scorer in the history of the Ohio State women’s hockey program, former forward Natalie Spooner, was selected to play for Canada in the 2018 Winter Olympics, which will be held in February in PyeongChang, South Korea. This will be the second Olympic Games for Spooner, who played for Canada in 2014. She will be looking to win her second gold medal in the Olympics. Spooner ranks second in program history in both points (163) and power-play shots (33). As a senior, she was one of the 10 finalists for the Patty Kazmaier Award, which is given to the top collegiate women’s hockey player. The No. 2 Ohio State wrestling team entered the season with sky-high expectations and has lived up to its lofty goals. It has dominated every dual meet, won both meets at the Thanksgiving Throwdown and won the Cliff Keen Las Vegas Invitational team title. That reign of supremacy continued into the past weekend. On the road, the Buckeyes decimated Maryland 45-3 and took down No. 17 Rutgers 29-11. Top-ranked 125-pound wrestler Nathan Tomasello returned from an injury that kept him out of the first two months of the season, with a technical fall win against the Terrapins. He did not wrestle against Rutgers. Ohio State has multiple matches against highly ranked opponents left on its regular-season schedule. It will take on No. 7 Iowa, which is undefeated, on Jan. 21, and faces No. 1 Penn State in a battle of the top two teams in wrestling on Feb. 3. Ohio State followed up its NCAA championship-runner-up season with its highest preseason ranking by Inside Lacrosse since 2014. The Buckeyes came in at No. 8 in the preseason rankings. They are ranked behind No. 4 Maryland, which beat Ohio State to win the 2017 NCAA championship, and No. 7 Rutgers. Fellow Big Ten teams Johns Hopkins and Penn State are also ranked in the top 25 at No. 11 and No. 13, respectively. Ohio State will take on eight teams ranked in the top 25, including four at home. It will also play against Duke, the top team in the rankings, in an exhibition before the season opener on Jan. 27. Sophomore attack/midfielder Tre Leclaire, sophomore midfielder Ryan Terefenko and senior defense Ben Randall were also named to Inside Lacrosse’s preseason All-American team. 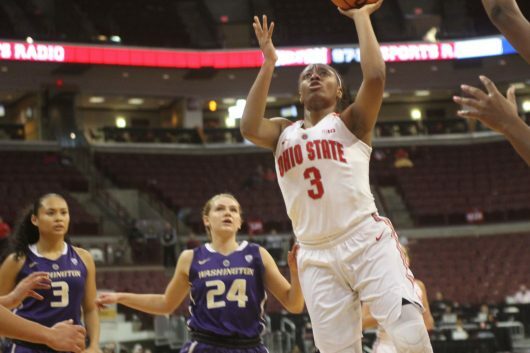 Ohio State will kick off its season with a game at Cleveland State on Feb. 3.